I hope that my Christmas Gift ideas are helpful. I enjoy putting them together and often I’m buying them for friends and family. I enjoy the gift of skincare. I love introducing people to natural products and helping them to discover new brands. If people are unsure or reluctant to take their first steps to Green Beauty you can assist in this for Christmas. 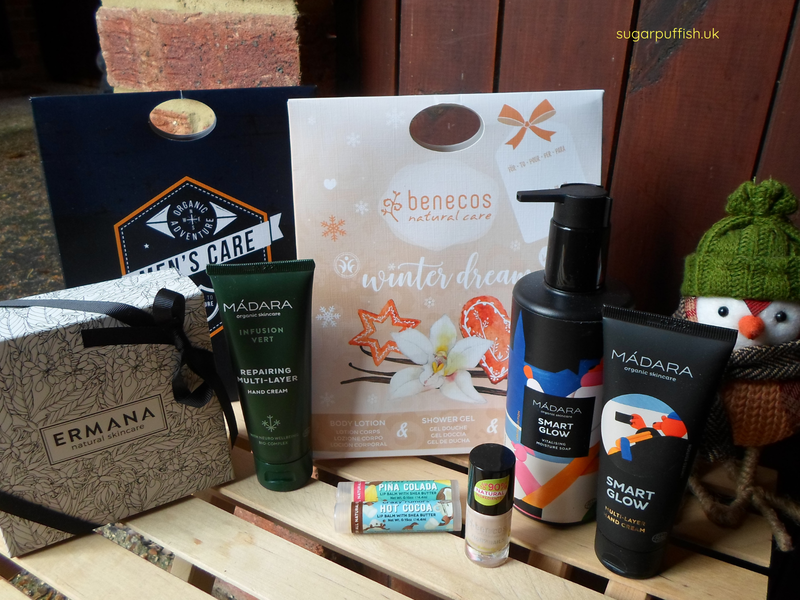 Love Lula offer a range of products for all budgets and ethics so I decided to choose some gift options and share my ideas with you. I’ve tried a couple of products from Ermana and enjoyed using them. This set is beautifully presented in a box with ribbon and contains Cleanse mini balm, Refresh balm and Comfort mini balm (each item is 15ml size). I have previously reviewed the cleanse balm and think this is a lovely way to introduce someone to multipurpose products. Another one of my favourite brands and I regularly use their products. Madara recently re-vamped their hand creams but I’d been a big fan of their Protecting Hand Cream for quite some time. I thought the Smart Glow soap and hand cream could be gifted together as a set or individually. I like to think this as a useful and practical gift which would look lovely next to the bathroom or kitchen sink. Both products are suitable for Vegans. I’ve been a fan of Crazy Rumor for years in fact I first reviewed them back in 2013. The packaging looks different these days but they still have a fabulous range of flavours such as Hot Cocoa and Pina Colada. I think lip balms make the perfect stocking fillers and Crazy Rumor are suitable for Vegans. Another great stocking filler idea and I like that Benecos have two size options. I picked up the 5ml and it’s the cutest size. You could create your own pamper manicure gift set by pairing a nail polish with Madara Infusion Vert Repairing Multi-Layer Hand Cream 75ml and a nail file. If you would like to shop for these products or discover other gift items then head over to Love Lula. At this time you can get 15% off until 05/12/18 Noon GMT using the code FRIDAY (T&Cs apply see website for more info). Disclaimer – I'm part of the Love Lula Blogger Programme and can select PR samples each month, I am not obligated to review and all opinions are my own. Prices correct at time of publication.